Some weeks ago we dealt with a colony with some aggressive tendencies by removing the queen. One week later we went through the hive carefully and removed all of the queen cells. We checked again a few days later to be certain that no queen cells remained. By doing this, we prevented the bees from making a replacement queen. We then introduced a frame with eggs and young larvae from a donor colony, from which, it was hoped, they would make a replacement. This week we inspected the colony for the first time. Our aim was not to inspect every frame, but just to check on the general health of the colony and look for signs that a new queen is present, whilst causing minimal disruption. We were pleased to observe that the colony was calm and showed no signs of aggression. Whilst aggressive bees can often be very productive, as hobby beekeepers we do not want an aggressive colony; they are not pleasant to work with and are best avoided in a garden situation. While the new queen was developing, there was naturally a check in the brood, so it was good to see that the colony still had plenty of bees. We have two brood boxes on this hive and the colony had built up to a good size before we decided to remove the previous queen. We removed the first frame from the top box; they had not yet drawn out the comb on this frame. The next two frames were largely filled with honey. The next frame, though, had some sealed brood, eggs, and larvae, indicating the presence of a new queen. The next frame along was almost entirely covered with brood, with an almost perfect laying pattern, so we can be confident that she was properly mated. 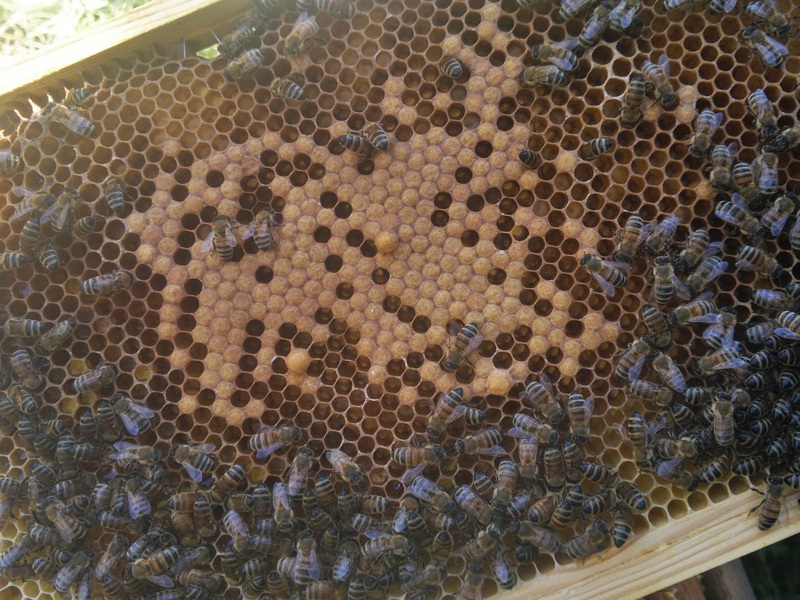 At this point, we would have been happy to close up the hive, but we were fortunate enough to spot the queen on this frame; she was already a good size and looked to be in perfect health. As the queen was on this frame I did not have a chance to take a photograph, but did manage to get a quick shot of the neighbouring frame. We very carefully returned the frame to the hive and closed up. We can probably leave it for a couple of weeks now before we inspect again as they are unlikely to swarm at present.